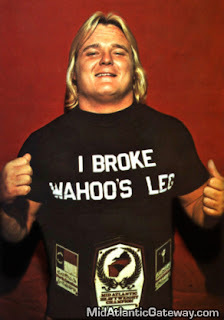 It is one of the most iconic images from the 1970s in Mid-Atlantic Championship Wrestling and Jim Crockett Promotions: Greg Valentine with a big grin on his face, wearing his newly won Mid-Atlantic championship belt, and sporting the infamous "I Broke Wahoo's Leg" t-shirt. 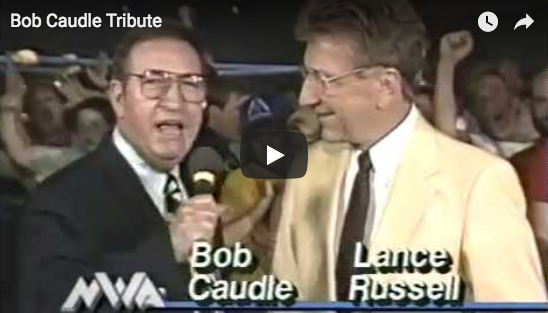 It's hard to believe that match happened forty years ago today. 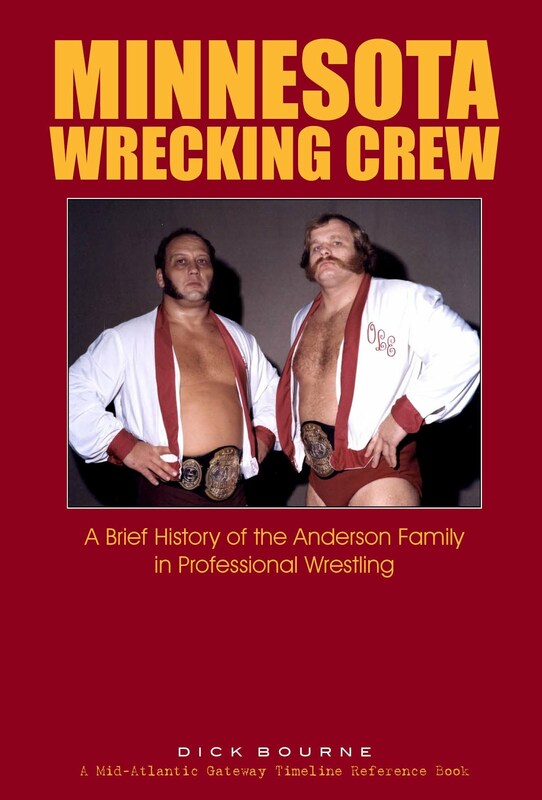 It took place on Wednesday night, September 7, 1977, at a TV taping at the WRAL television studios in Raleigh, NC. 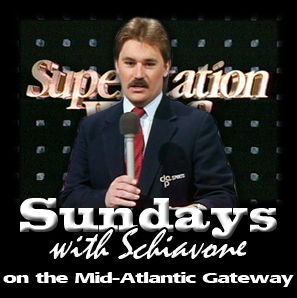 The match stands the test of time and is available in its entirety on the subscription service NWAOnDemand.com. 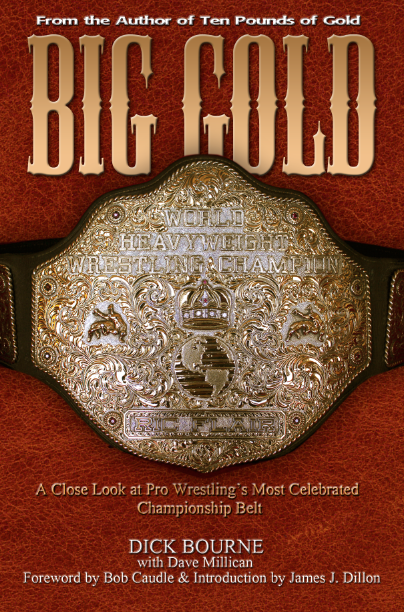 Wahoo McDaniel and Greg Valentine feuded over the Mid-Atlantic heavyweight championship for much of 1977 and early 1978. 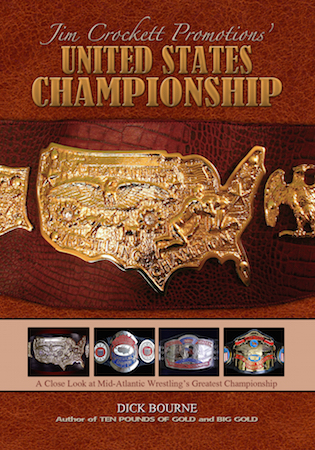 The zenith, however, was the memorable televised bout where Valentine regained the title from McDaniel and broke his leg in the process. 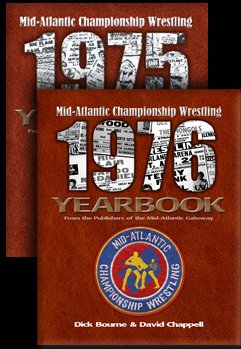 It is one of the most famous matches and famous angles in Mid-Atlantic Wrestling history. But part of what made it so memorable was Valentine's classic t-shirt that he wore in the aftermath. It was a simple black shirt with block lettering that simply said "I Broke Wahoo's Leg", and on the back of the shirt read the equally in-your-face declaration - - "No More Wahoo." Valentine wore the t-shirt on television and in arenas for months, enraging fans along the way. A photograph appeared in "Mid-Atlantic Wrestling Magazine" and in newsstand magazines as well, with a grinning Valentine wearing the shirt and the belt, taunting Wahoo and creating heat for their return bouts that would follow when Wahoo returned to action. In an interview with the Mid-Atlantic Gateway, Valentine admitted that the t-shirt wasn't his idea. "It was George Scott," Greg told David Chappell. 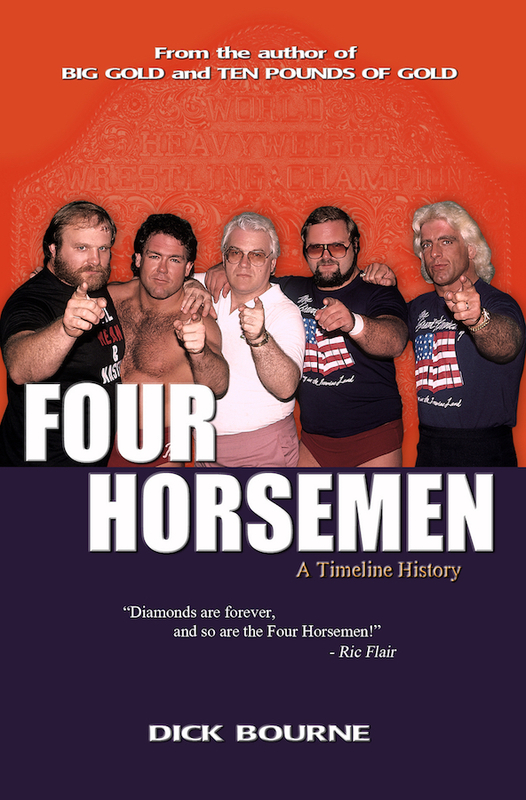 "George Scott was the booker back then. It was mainly his idea. I certainly give him the credit." Greg would explain in TV interviews that he had the t-shirts custom made for him at a shop in Las Vegas, never mind the fact that the familiar look of the t-shirt could have been made in any t-shirt shop in any mall in America in those days. But the line was funny, and served to only further enrage Wahoo's fans. 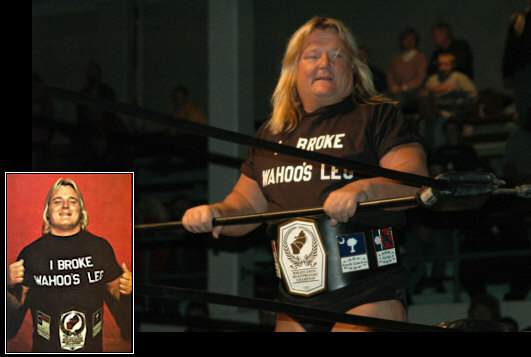 Valentine wearing tiny replicas of the Mid-Atlantic heavyweight title belt and the famous t-shirt. The match and the angle still live on today in popular culture. Facsimile shirts are spotted being worn by wrestling fans (even journalists!) at wrestling conventions. 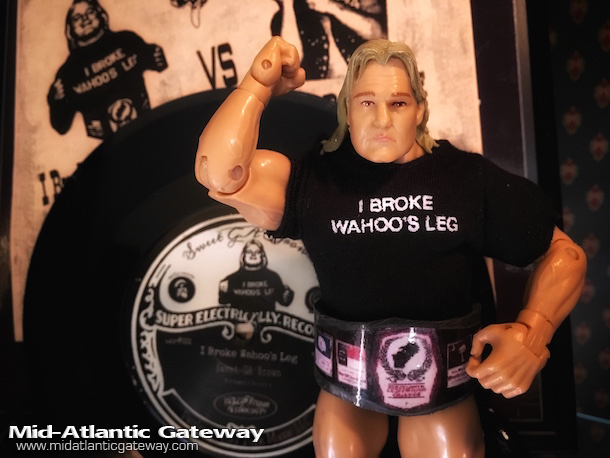 Collectors can custom-order a miniature "I Broke Wahoo's Leg" shirt for their action figures. Wrestling broadcaster Matt Striker mentioned the famous t-shirt in 2014 during a match on an episode of "Lucha Underground." And singer/songwriter Sweet G.A. 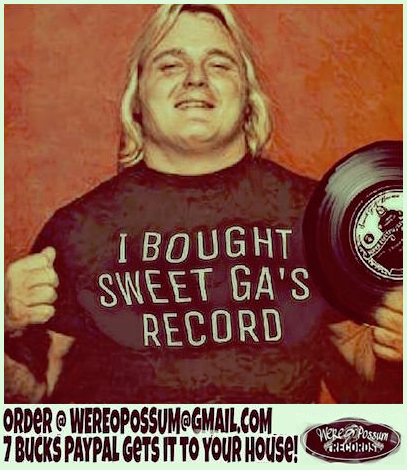 Brown immortalized the classic wrestling angle in his wonderful song "I Broke Wahoo's Leg" which I have written about previously here on the Gateway. 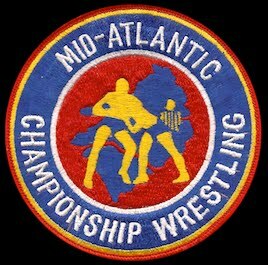 Greg tells us that even forty years removed from that match, fans still ask him about it. "I get asked to sign my autograph that way," he told me. "All these years later, people still remember that." 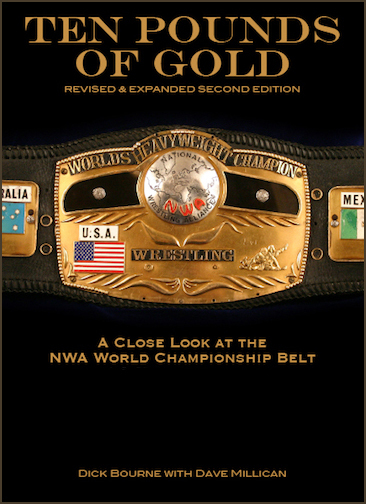 Valentine re-created the angle at a Legend's Show in Spartanburg, SC, also wearing a replica of the Mid-Atlantic title belt. The site of Greg wearing that shirt and belt in 2005 took you right back to 1977. 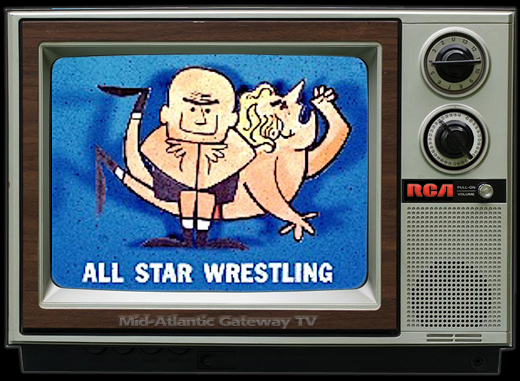 So today we raise an elbow and celebrate this lasting memory of one of Mid-Atlantic Wrestling's most brutal feuds and memorable moments. 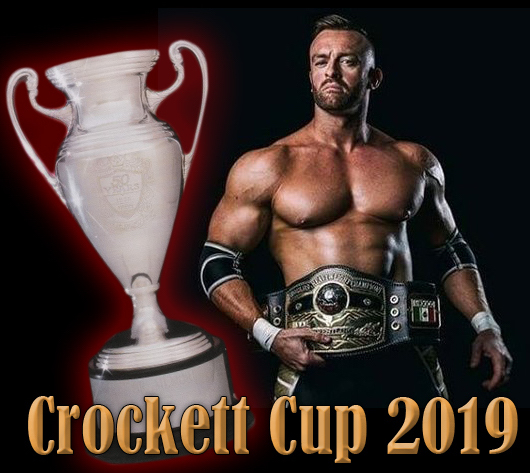 It is has proven to be a moment that Mid-Atlantic Wrestling fans have not forgotten.